Walmart drew White House praise for pledging to hire 100,000 veterans, but some workers pan the plan. Reached by phone, Tulsa Walmart worker Christopher Bentley Owen was less than impressed. “You’re still subject to all the crap that comes from working for Walmart,” Owen told The Nation. “Extremely low wages, poor benefits and everything else. If that’s the best that’s available for veterans, then there is something wrong.” Owen served in the US navy for two years. He joined the union-backed workers’ group OUR Walmart after being required to attend a meeting in which management read a statement urging workers not to go on strike. A Walmart official clarified in an interview with the Times that not all of those jobs would necessarily be full-time positions. Simon’s speech did not make clear what fraction of the newly hired veterans are expected to land full-time jobs, whether the plan involves any increase in Walmart’s overall staffing levels or whether the plan imposes any economic cost on the company. 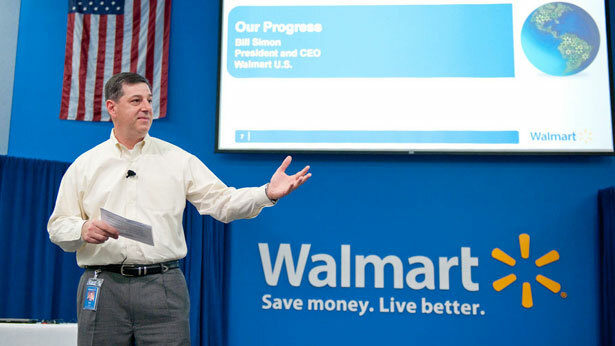 Following an early morning inquiry from The Nation regarding these questions, Walmart e-mailed a statement summarizing Simon’s speech but did not directly address them. As attendees filed out of Simon’s speech, activists from several labor groups marched through the lobby in a surprise “mic check,” echoing a series of speakers slamming alleged discrimination, understaffing and poverty wages under Simon’s watch. As convention staff confronted one speaker, another would take over, until the group turned and left as staffers threatened to call the police. Outside, workers and organizers led a series of chants slamming Walmart and Darden, the restaurant industry giant on whose board Simon sits. This isn’t the first time Walmart has drawn kind words from the Obama administration. As The Nation has reported, Michelle Obama also praised the company’s announced plans to sell fresh produce in “food deserts” (plans which critics contended amounted to cover for the company to overcome activists’ opposition to its urban expansion plans). In November, days before workers mounted a Black Friday strike, White House Senior Adviser David Plouffe sent out a mass e-mail touting Walmart’s CEO’s support for a “balanced” deficit plan. Walmart’s presence at a White House meeting on gun policy last week heightened speculation that the Obama administration will seek to enlist the retail giant in selling a gun control compromise. The White House did not respond to an early morning request for comment, or to a previous inquiry from The Nation regarding Walmart’s labor strife. Walmart has a reputation for low wages; if New York City privatizes its bus-driving force, Allison Kilkenny writes, drivers could get a taste of the same medicine.